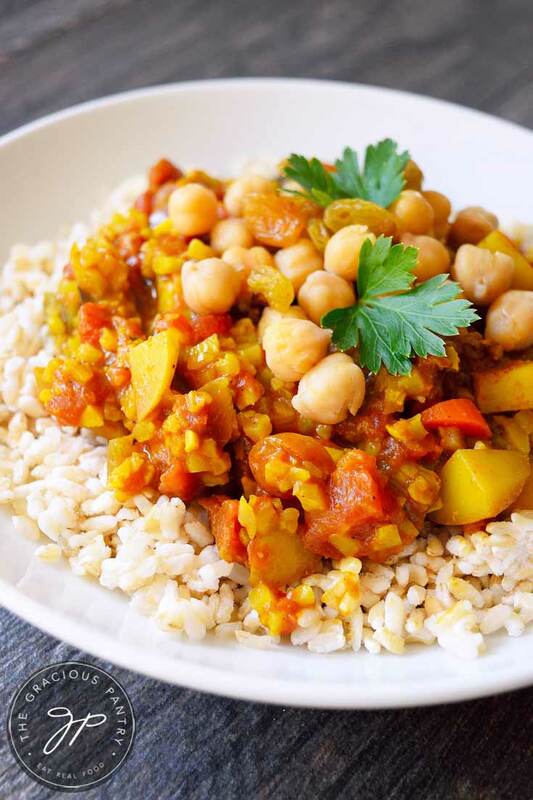 This clean eating vegetable curry could totally be my new favorite dish. I’ve been plant based for about six months now. So far so good! But I do find that it’s much easier for me to fall into a rut. It’s been an interesting balance trying to find foods I can eat and that Mini Chef will actually eat. Add to that the fact that I’m also avoiding gluten at the moment and it makes dinner time a serious challenge. As I write this, Mini Chef is on a week-long school trip, leaving me at home to eat whatever the heck I want. While I miss him terribly (yes, I was ugly crying when he left), I am using this week to really dive into trying new things. Foods that I like and don’t have to share! This one turned out amazing! I’m pretty sure it will become a staple on the weekends when Mini Chef is with his dad. Yum!! When this is first finished cooking, the spice is over the top. Let it sit for a few hours and the spice will calm down. It’s still a spicy dish though, FYI. Make sure your potatoes are cooked through. That’s how you know it’s done. Serve over brown rice, pasta or even quinoa! 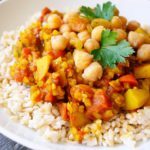 A deliciously spice curry you can enjoy over rice or even pasta! In a large skillet or pot, combine the diced tomatoes, potatoes, carrots and onions and bring to a strong simmer. Add in the riced cauliflower and spices as well as the coconut milk and cook until all the vegetables are cooked through. Stir in the coconut milk and chickpeas. When everything is completely cooked through, turn off the heat and stir in the golden raisins.